Enthalpy-entropy compensation (EEC) is an endlessly interesting phenomenon; it's the kind of topic that makes scientists either roll up their sleeves for a good fight or slowly walk away from the table. The basic idea is simple; when you are building new chemical functionality into a drug molecule to interact better with a protein (improving ∆H) you are also tying down the molecule (worsening ∆S) and constraining its movement. However since the two variables oppose each other this won't be reflected in the overall ∆G of binding which will stay the same. Scientists have been going back and forth over the causes of EEC and now there's a new paper from George Whitesides's group at Harvard, Schrodinger and Brookhaven which sheds some light on one possible, usually neglected factor: the subtle changes in the thermodynamics of the network of water molecules surrounding a ligand. 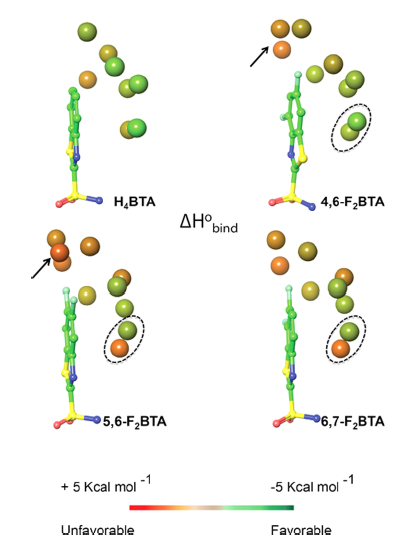 These are not the water molecules displaced by the ligand from the protein pocket (which have received considerable attention over the last decade or so) but the ones on the surface that contact the ligand on the outside. The paper is based on a workhorse protein system that Whitesides's group has been working on for a while now - carbonic anhydrase. The protein is stable, relatively rigid, biochemically well-studied, amply expressed and easily crystallized by itself and with several ligands; all features which make it a good model system to look at the thermodynamics of binding. Whitesides's group has found out that you can have ligands with different fluorination patterns that bind to the protein and show very similar ∆Gs of binding. This is unexpected, since you expect additional fluorines to give you better entropy from the hydrophobic effect. To explore the phenomenon the authors use two techniques; x-ray crystallography and molecular dynamics simulations. The former provides information on intermolecular interactions while the latter provides information on the thermodynamics of surrounding water molecules, more specifically about their enthalpy and entropy. The MD and thermodynamic calculations are done using the WaterMap tool from Schrodinger. 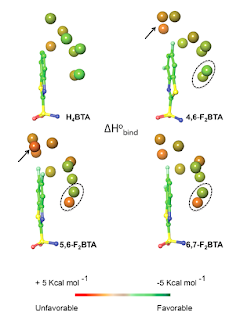 From the crystal structures the authors find that the enthalpy of binding can actually get unfavorable from the added fluorines as a result of repulsive interactions with a few oxygens in the protein. Since ∆G stays the same this means that the unfavorable ∆H in the active site might be compensated for by ∆H changes in the water network surrounding the ligand along with corresponding ∆S adjustments. In the picture above, water molecules with more favorable ∆H values are colored green while the unfavorable ones are colored red. Notice the difference between the three difluorinated analogs: the 4,6 analog has the most green waters, the 5,6 analog has the most red waters (and an extra red water compared to the others) and the 6,7 analog is somewhere in between. The gradation of unfavorable water molecules around the three compounds tracks well with enthalpies extracted from ITC. The entropies duly compensate. The thermodynamics of surface water molecules therefore certainly seem to be one possible reason for the EEC. It's also worth noting that the behavior of the water molecules corresponds to what you would call an "enthalpy-driven hydrophobic effect". While we are neglecting second-order effects and while it's still hard to get quantitative agreement down to a kcal or so, I like the fact that we can eyeball such figures and at least qualitatively rank cases by favorable and unfavorable enthalpies. I also find it promising that we can actually do this kind of thing for surface water molecules which are part of a network; ten years ago most people might have thrown up their hands when asked to do this. Of course not every drug-protein binding case is going to be dictated by surface water behavior but the fact that we can at least get a semi-quantitative look at this important factor is, in my opinion, a valuable stepping stone toward the future. I can't see the article right now so they may have already addressed the question. My understanding is that the primary sulfonamides bind to CA in their anionic forms but the neutral form is usually the major form under normal physiological conditions. Fluorination will tend to increase the proportion of the neutral forms and, depending on the size of the effect, may need to be accounted for when interpreting the thermodynamic measurements. Good point, they don't seem to have addressed it at least in this article. Will look up their previous work on the topic. The pKas of the sulfonamide are corrected, so the argument is not valid. "I also find it promising that we can actually do this kind of thing for surface water molecules which are part of a network; ten years ago most people might have thrown up their hands when asked to do this." I disagree; people might have answered that the whole idea of a mappable water network around a protein-ligand system is an untested hypothesis, and so until one paper clearly demonstrates that this is valid, they have no time to lose. And they may still answer that, since no such paper exists (more on that later). A colleague of mine tested WaterMap 2 years ago with the DUD database as a benchmark, and it simply did not work. I was not surprised. I doubt the computer simulations reported in the paper you refer to are making any sense, not only because WaterMap was used, but also because benzothiazole sulfonamides are known to be among the groups that are almost impossible to properly parameterize. And the authors only tested one such series.